Is Spray-Lock Concrete Protection a Bond Breaker? “Are Spray-Lock Concrete Protection (SCP) products bond breakers?” To answer this question, we need to define a bond breaker and examine how SCP reacts in the concrete matrix. A bond breaker is a product that forms varying layers of separation between contact surfaces. SCP is a penetrating concrete treatment that does not change the surface of the concrete matrix. An SCP application is not a coating and has no negative effect on bond integrity. Testing of SCP’s application on concrete was performed to show that the product is not a bond breaker. 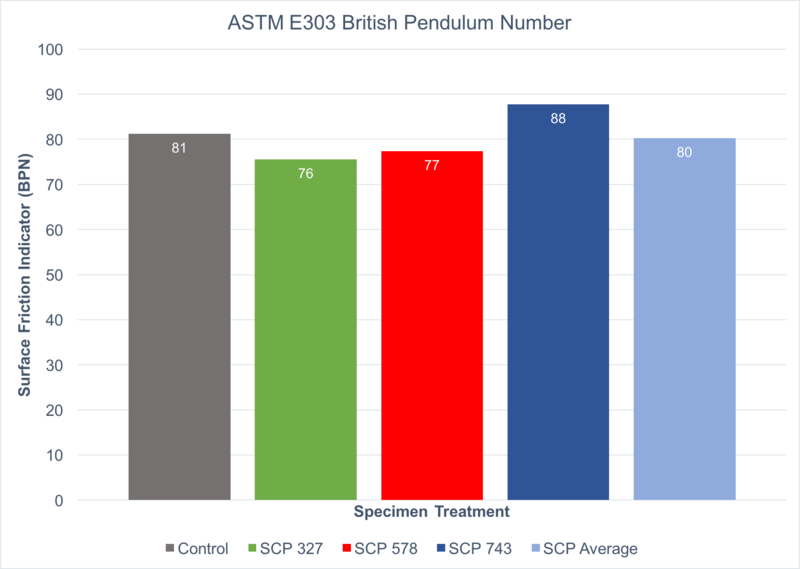 Test methods included (1) ASTM C1583 Standard Test Method for Tensile Strength of Concrete Surfaces and the Bond Strength or Tensile Strength of Concrete Repair and Overlay Materials by Direct Tension (Pull-off Method) and (2) ASTM E303 Standard Test Method for Measuring Surface Frictional Properties Using the British Pendulum Tester. In the ASTM C1583 test method, the concrete sample is cleaned of surface contaminants and loose or deteriorated concrete. The sample is then prepared to the typical surface conditions of the in-place concrete structure. The test material is applied and cured in accordance with the manufacturer’s specifications. After cure, a core drill is used to make a circular cut perpendicular to the surface. The test material is left intact on the concrete substrate, while a steel disk is attached to the top of the material using an epoxy adhesive. A tensile loading device is then attached to the steel disk to apply a tensile load to the test sample with force parallel to the vertical axis of the specimen. The load is applied until failure, and results are recorded. In the ASTM E303, the concrete surface is cleaned and freed of loose particles. The instrument is placed and leveled. The pendulum is lowered so that the edge of the slider just touches the concrete surface. Water is applied to thoroughly cover the test area. One swing is performed, and the reading is not recorded. Four more swings are made, and the surface is rewet before each swing. The results are recorded. 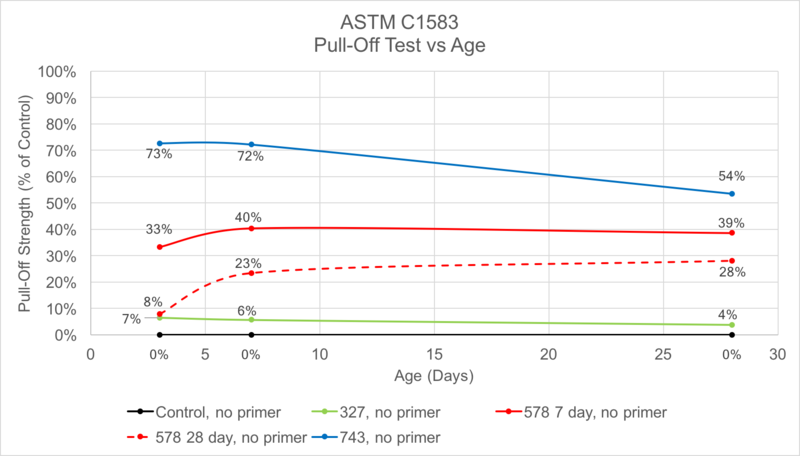 Testing shows that SCP Treatments increased the pull-off strength of concrete up to 73% compared to untreated concrete and had no statistical effect on surface friction. Since SCP Treatments become an integral part of the concrete matrix and are not surface coatings, there is no need for a mechanical key, additional treatments or removal prior to using a covering or coating. SCP can be used in conjunction with all types of coverings and adhesives without a negative impact on a covering material or adhesion of material to the concrete. https://concreteprotection.com/wp-content/uploads/2017/06/Screen-Shot-2017-06-23-at-2.59.09-PM-1.png 358 925 admin http://vps30932.inmotionhosting.com/~sprayl6/wp-content/uploads/2013/04/SCP-Logo1-300x136.jpg admin2017-10-06 17:46:372018-10-19 04:59:18Is Spray-Lock Concrete Protection a Bond Breaker?